We will be running the Morts Dock Crane (built 1891) at Cockatoo on Sat 20th April (Easter Sat). Probably also a chance to look in the cab of travelling steam crane No 2 and No 1 under re-construction in the workshop. Thought your members may be interested. There are two ferry routes from Circular Quay that call at Cockatoo: the Parramatta ferry is the fastest as first set down is Cockatoo. The other route goes Circular Quay, Balmain, Birchgrove, Greenwich Point, Woolwich and then Cockatoo. A delightful trip either way. Not sure of the weekend timetable but that’s all available online. The service is very good. The Morts Dock crane is next to the Fitzroy Dry Dock. The Morts Dock crane has a reversible engine but No1 & 2 are unidirectional with dog clutches and cone clutches for reversing. 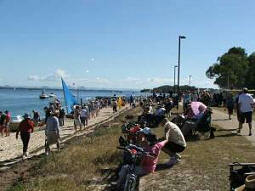 The best place to launch the boats is Bruno Bay Boat Ramp, which is also adjacent to the Caravan Park. After launching the boat, steam upstream approximately 300 metres to Joiners Inlet, which is the inlet channel for the Humphrey Pump. There are moorings for the launches and our resident paddlesteamer, the ps James Maiden. Boats can be launched before the Friday cruise, or on the previous day. Leave Cobby early morning & steam 20 km downstream through Lock 3 to the Overland Corner Hotel for lunch. There is a short walk from the river to the Hotel. After lunch, steam back upstream to Cobby for a BBQ tea and tall tales around the campfire. A BBQ and salads will be provided at a small cost. Rodney Martin did this cruise at a previous Cobby Capers and with going through the lock twice, it’s a full days cruising. Leave Cobby early morning and steam downstream to Chambers Creek and into Lake Bonney. Steam across Lake Bonney to the town jetty. Lunch at the Lakes Bakery Café, or try cooking your meal using your steam plant. Either steam back to Cobby or retrieve the boat at the nearby boat ramp. Note, if the day is windy, it will probably not be a good idea to go past the Nappers Creek Bridge into the lake as there will be large waves. Chambers Creek itself is sheltered. Distance is approximately 22 km each way. Note, the clearance under Nappers Bridge is just over 9 feet. Also, Damien has recently done this trip in the Clayton Maid, so providing you stick to the channel, you should not have problems in Chambers Creek with the depth. The Maid’s draught is about 20”. Saturday Tea will be a Lamb spit roast 2 course meal at the museum, $20 head. Catch a ride in another boat, go exploring or just relax and tell lies. The museum will have the Bagnall 0-4-0 loco in steam as well as the Fowler B6 Crane Engine and Fowler Z7 Ploughing Engine. These will be available for rides and if you twist an arm of two, a turn on the regulator. (Subject to approval from the safety officer.) The museum Food Shoppe will be open for lunch, drinks and ice creams, and tea will be at the Cobby Club. Gday Peter, I just seen your recent posts on the Steamboat Association page, and I thought I’d just pass on the following message to you. 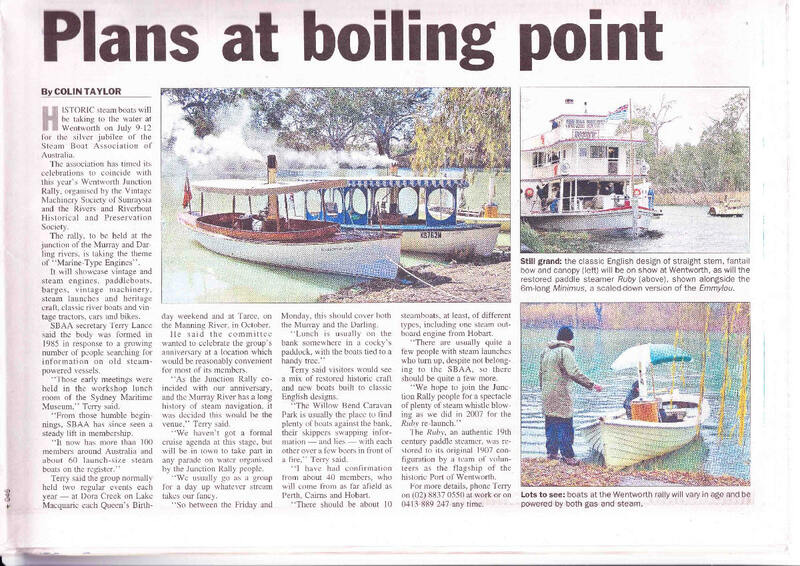 I work on the Paddlesteamers at Echuca, Vic. And I am organising a weekend cruise on August 10-11 for steam boats, and also traction engines that will go by road, from Echuca to Cape Horn Winery (aprox 30km by river) and return. Could you please pass this onto any fellow members that would be interested in attending our weekend run. And I can pass on more information. The more boats we get the more fun had by all! 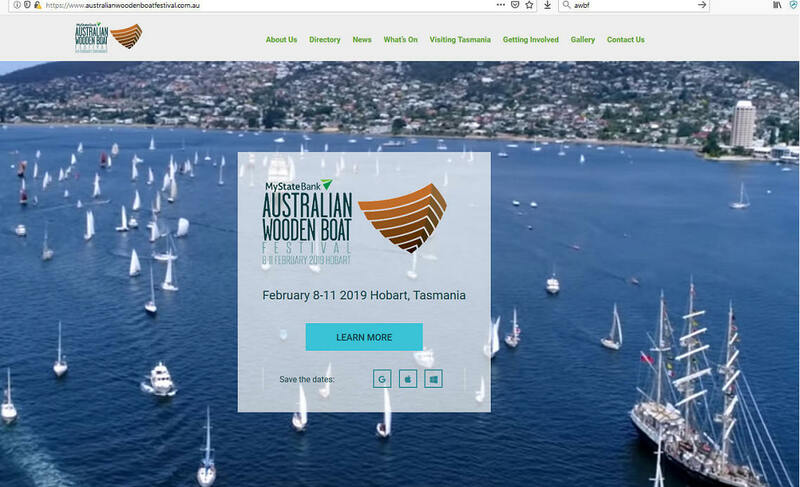 Members of Wooden Boat Associations and other boating groups attending the Australian Wooden Boat Festival in February 2019 are invited to attend the Guild’s pre-festival BBQ. Location: Mariner’s Cottages 42 Napoleon Street Battery Point. Cost: $15pp + drinks available for purchase. BBQ food will be gourmet meats with Vegetarian option. Tasmanian drinks. RSVP: An indication of numbers attending will assist in catering. 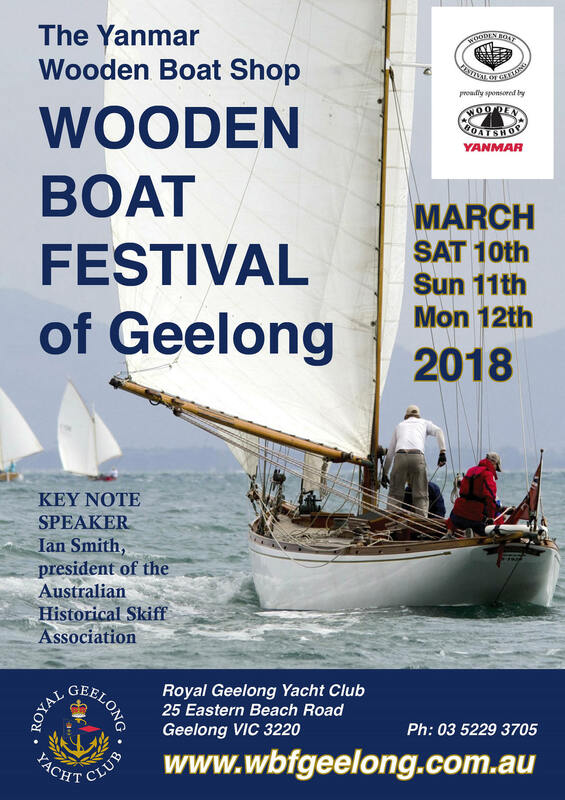 Wooden Boat Guild of Tasmania Inc. If anyone is interested in attending this regatta, please correspond direct with Doug. Pummicestone Passage at Bribie Island is a nice bit of water. The island is worth exploring, especially the canals (of the rich & famous) and there is a great new pub on the ‘mainland’ shore, and they have a pontoon!! Last year, members Mal McKay & Don Parker entered in the Steam Launch ‘Choof-N-Puff’ and returned with reports of a great time all ‘round. See what Don had to say on p11 Steam Leak #125. As of a day or two ago, I was told that over 100 boats had already entered, so if you are still thinking, think quick as entries close 24th November and entries are building. Entry is via the website www.thepaynesvilleclassic.com.au and click ‘ENTER HERE’ on the homepage. On-water entry fee looks like $55 plus $15 for a commemorative plate. Better check. 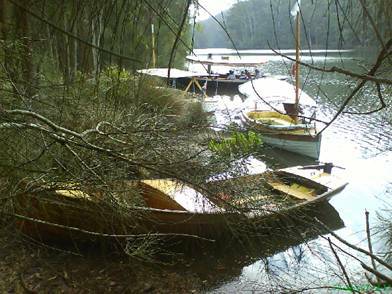 The Shoalhaven River Festival is scheduled to run over the weekend of Saturday the 22 and Sunday the 24 of October 2016. The festival will start with a parade on Saturday that starts at midday, passing through the Central Business District of Nowra and finishing at the river bank where all the food and market stalls will be positioned along with the entertainment stages. The marine side of the festival will commence on Saturday afternoon and continue until PM on Sunday. 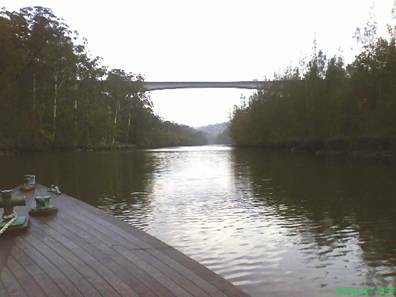 There will be a marina established on the Nowra side of the Shoalhaven River with launching facilities at Greys Beach on the opposite side of the river. Security will be in place on the marina from PM Friday 22 October 2016 until PM Sunday 24 October 2016. There will be a parade of Vintage Boats on Saturday afternoon with an additional parade of all boats at night prior to the fireworks display. Vintage Boat owners are encouraged to switch on their navigation lights and all the additional lights that can be fitted on the boat and add to the spectacular of the night parade prior to the fireworks display. If you wish you can stay out on the river to watch the fireworks display. Sunday will be a leisurely cruise for the Vintage Boats either up river or down river depending upon what the skippers wish to do. 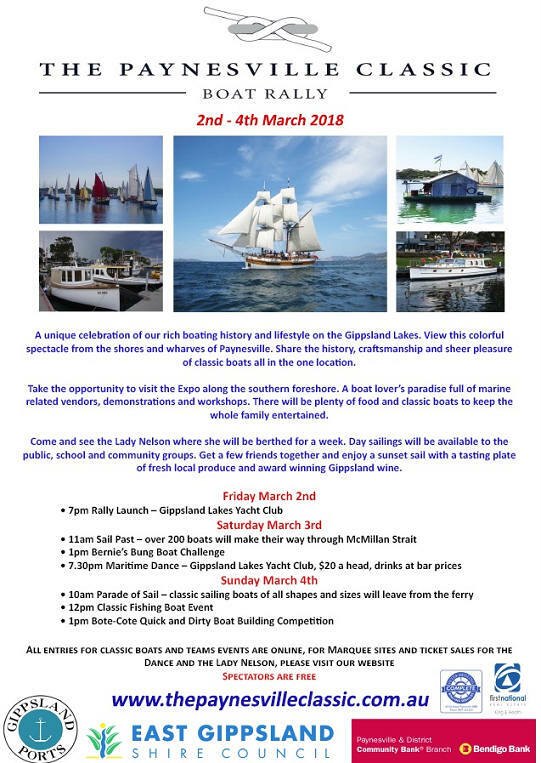 If you don’t want to participate in the cruise on Sunday or for that matter the Vintage Boat parades on Saturday just come along moor your boat in the marina and put your boat on display so the public can admire a Vintage Boat and you can soak up the atmosphere of a spectacular festival. The committee of the SBAA have agreed that we hold the regatta in honour of our late friend and mentor Len Lark who passed away recently. This is the third time that SBAA members and friends have headed up this magnificent secret waterway. Once we have passed up the channel to the west of Spectacle Island and steamed past Cheero Point we are unlikely to see another boat or person all day. 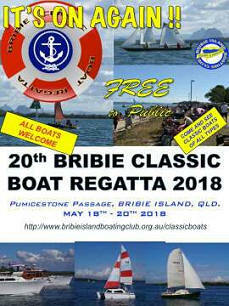 Tentative plans so far include a 9.30 for 10.00 start at the Ruins boat ramp on the north side of the F3 Hawkesbury River Road Bridge. Be a bit early if you need extra time to get steam up as we need to get away by 10am to make the most of the tide. Late starters will need to catch up. Lunch for a couple of hours. BYO Picnic and rug etc. If you don't have a boat and would like to come along let me know and I am sure I will be able to arrange a berth for you. Held alongside the Junction Rally there will be plenty to see and lots of like-minded people to talk to about steamy things. 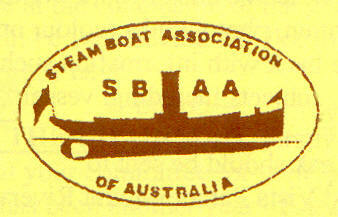 The Junction Rally (http://www.junctionrally.org/ ) is still accepting registrations, and the SBAA does not require anything other than for you to turn up and enjoy playing steamboats on the Murray/Darling. The Junction Rally dinner, if you have registered for this, is on the Saturday night and the SBAA dinner at the Wentworth Club is on Sunday night from 6pm, pay as you go. SBAA on-water activity will be as usual, ad hoc, but will fit in with the Junction Rally. We will be participating in the on-water parade. Both rivers will be explored over the weekend, the earlier you get there the more river you can enjoy.